This looks heavenly! I am similarly tart obsessed. And I love dandelion greens but have a really hard time finding them for sale here. And way too terrified of pesticides to simply pick them out of other people's yards. What beautiful fresh colors. Happy Spring! You rock in savory as much as you do in sweets, darling - what a delicious tart! 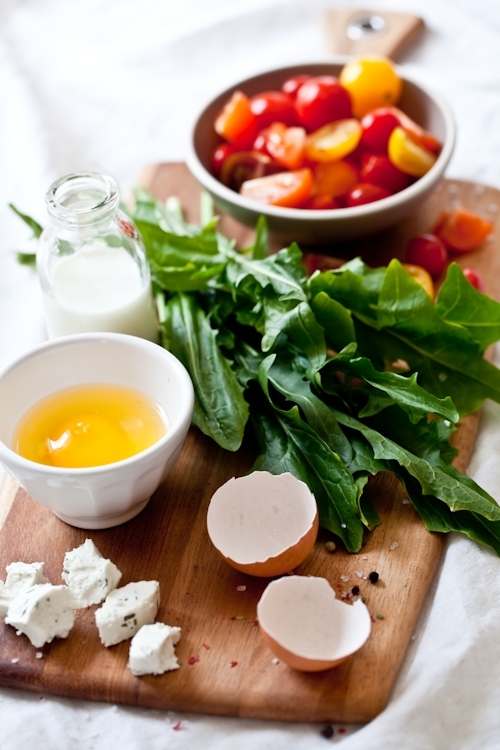 I love goats cheese - had tons of it in France, in all sorts of dishes (salads, sandwiches, quiche, pasta, etc.). Yum! Such a gorgeous tart! I just love your work! Happy sigh . . .
Beautiful! So fresh and vibrant. Oh YUM! that looks so tasty and refreshing! I love tarts too. This seems very fresh, great for summer time. m: Absolutely! Great minds think alike, right?! !Tomatoes are very much in right now and throughout the summer. Love them! Those scream Spring is here to me - in a very, very good way. That looks really good. I love how the arugula and tomato brings so much color. I have been meaning to make your puff pastry recipe. 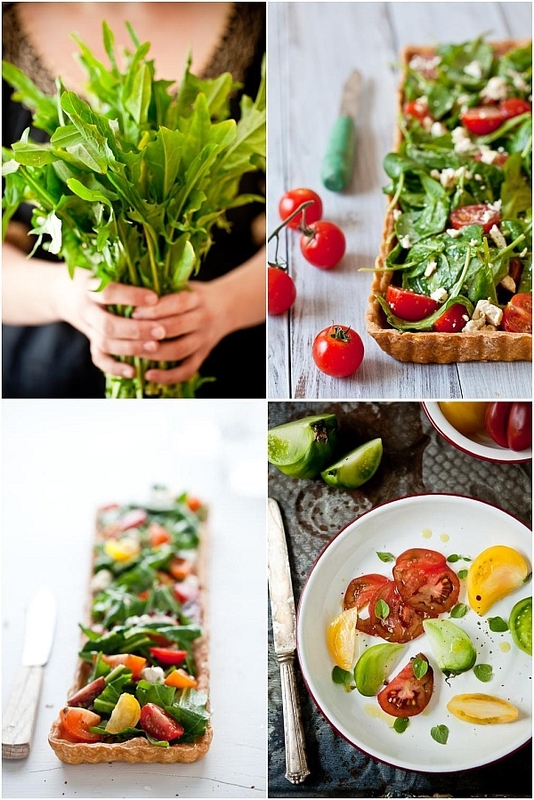 All those colorful greens look so delicious doesn't even look like you need the tart! Lovely tarts Helene. I had never thought of making the shells and freezing them. Thank you for the idea. I love how you share where you have bought your props. Thank you. We don't have an anthropologie store here and their shipping fees to Australia are crazy, which I dsicovered when I went searching for some of the little custard cups by Samantha Robinson. Who turns out to be Australian, and on checking her website they are setting up for selling online. Hopefully I'll get some then. This tart is very colorful! I am a new reader of your blog and find myself dreaming of making all of these wonderful recipes! I am curious if you can recommend a great French cookbook for me. I am a self-taught cook, a newlywed, and a late twenty-something that is still learning how to prepare yummy meals for my husband and friends and family. I am Italian and typically cook traditional meals that I grew up with. I'm looking to expand my horizons into French cuisine! That looks delicious! 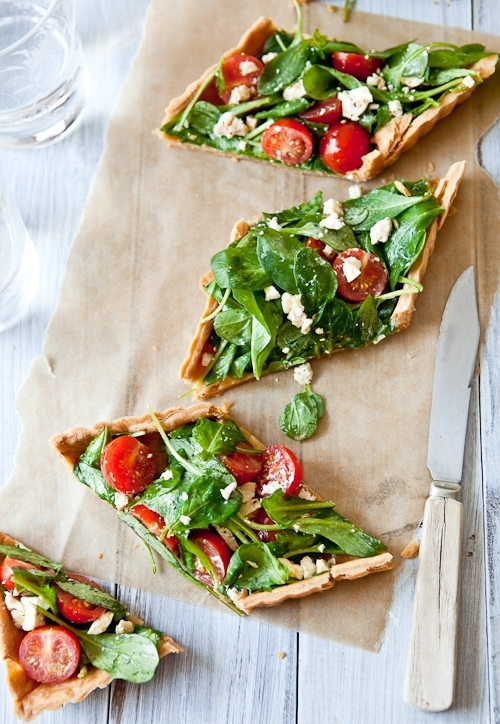 How much better a salad is when it's in a yummy tart crust. Helene, you sure have a knack for turning even savoury almost healthy looking things into a luscious dessert that no-one could resist. Such beautiful pictures! I just want to make and eat everything you post! this looks absolutely stunning! the pictures are beautiful, and I really like the idea of something salad-y on pastry! What a mouthwatering and beautiful space you've created here; thank you for sharing! That's too bad about the domain. Have you tried to contact them? I would think it would be of no value to them now that you have this wonderful popular blog. I love tarts just like you, but mostly on savory side, so this is MY tart. And, I want to make triangles, because I feed two little twin boys that want everything in either triangles or stars. And, they have very sophisticated taste for not quite three. What lovely pictures (as always!). I like that tarts are so simple and can be made with almost any ingredients and they will be delicious! I have visited Charleston many times and know that it must be wonderful to live there. I am in the same situation with a URL. Some dude has www.ingoodtaste.com and is just sitting on it - has been for years! He wanted $1500 for it and that is simply not in the cards right now! Love how you acquired you nickname! Just tried something really similar inspired by your recipe, and it was fantastic!!! Thank you! Seems we all have tomato tarts with goat cheese on our minds, must be all the beautiful spring/summer produce that is starting to make appearances at our markets. I love the addition of greens with yours, I will have to try that next time. And what a treat to have Tami with you for a few days of R&R, which involves great food and photographing! Helen, I love that you have added a prop section, this is a great resource for all of us! Goat cheese sure is one stinky type of cheese but so good for you. If you can make it right, it would taste like heaven. Nicole: Mastering The Art of French Cooking by Julia Child. Reading it and cooking from it is understand the French much more than any other book out there. Oneida: goat cheese stinky? Smell some Livarot to meet real stinky!! The last photo is just outstanding. In fact all of them are... but specially the last one. Love the way you have used depth of field in this. Love the colors in the photo. The Tartlette looks amazing! Wish I was having that for dinner tonight. Love the photography too. You are very talented! just found your blog through bakerella. I really feel welcome and at home when I come here, each and every time, I swear! 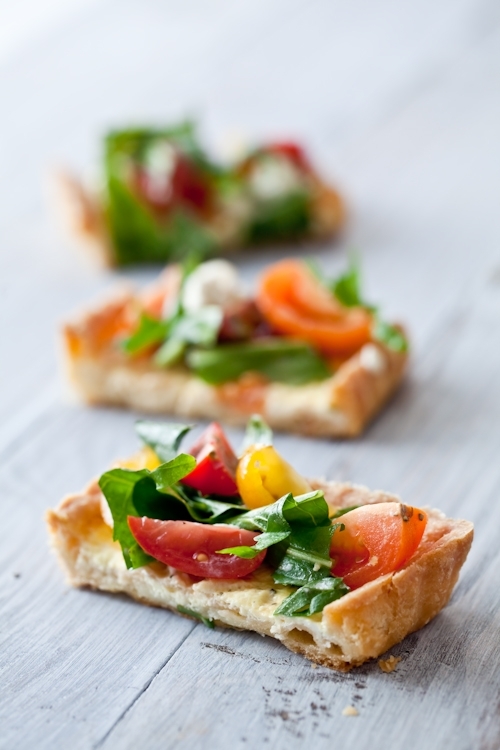 I love tomato and goats cheese tarts. I love the sweetness of the tomato against the strong cheese. Your pictures are amazing by the way, really professional. Those look amazing! I just love the fresh tomatoes! Oh my! I do believe that I can smell, as well as taste,these beautiful tarts, just by looking at your breathtaking photos! I have my bag on my shoulder and am counting the minutes until I can scoop up all of these glorious ingredients at my Farmers market! These tarts are beyond fabulous! I've just started making tarts, and I must say I am a convert. Yours always look gorgeous and I appreciate the recipes. I wanna try it now..
What a delicious looking tart! And the idea of topping the filling with fresh vegetable is brilliant! I will try it this week-end! And waow, the pictures are beautiful! Oh, you are speaking my language with these photographs and ingredients. Definitely on the must make list! Mmm, this looks great. i will definitely try this recipe. This looks delicious, and the photographs are disgustingly beautiful, as always! I'm looking forward to trying the gluten free puff pastry for my GI sister sometime. THANK YOU for working so hard to perfect it! It astounds me how far GF baking has come in the last few years, with baked goods that look and taste every bit as amazing and their wheaty brethren, all thanks to intrepid cooks like you. I cooked this on Saturday as a starter for our Labor Day BBQ (May 1st is Labor Day in Italy) and it was just gorgeous! I just added an extra egg yolk (the filling seemed a bit too liquid to me, but maybe I should have been using a larger egg) and garnished with cherry tomatoes dressed with fresh thyme, fleur de sel and olive oil, shredded feta cheese and arugula... sooooo fresh and tasty! Thank you for being such an inspiring source to my kitchen! I'm so glad you've been posted so many delicious gluten free recipes on your site. My mother has celiac, and I know what a challenge it can be! I've passed a number of these along to her, and I know she appreciates it. This looks amazing: such gorgeous photos as always! I can't wait for it to be MY tartelette too! Puff pastry is one of my weaknesses, so delicious and satisfying in all forms and sizes! This is a great idea and I will have to find the right moment to share with others, instead of eating it all by myself. I am drooling! These look amazing. I love tarts. I just found your blog and I am thrilled - just love, love, love it!!! Thanks so much for posting this. I just baked this tart for a mother's day dinner. I used my own recipe for the crust and my own maple syrup vinaigrette. But I followed your recipe for the egg filling and salad, and it was so delicious! I cannot wait to experiment with different salad toppings. hi helene, i am getting ready to make your macs, the ones we made back in march when you were in LA. Photo question - Do you use a macro lense? I am on the verge of purchasing one. I love your photography. Let's plan a weekend here, in L.A., like you are doing in CO.
Ok, your blog is so awesome! I've just been flipping back through each page and not only do the photos and recipes look so good, I love your writing as well! This looks sooooo good! I love your blog! This is the most beautiful tart I have every seen! I love your blog. Thank you for sharing your gift of making lovely food and art!!!!! !